How many of you drive to work in a Datsun 180B? And how many of you still use their original Nokia 3210 mobile phone; you know, the one with the monochrome screen, monophonic ring tones and hot features such as… SMS? 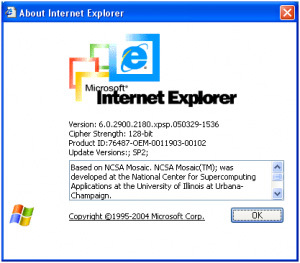 Now answer this question - how many of you still use Internet Explorer 6 as your default browser? You may simply refer to it as “The Internet” and double-click the blue ‘e’ icon on your desktop. Or perhaps it is a “custom” build in your office with your company logo on it and your intranet as your home page. According to current statistics almost 15% of all World Wide Web traffic is due to the seriously outdated IE6 browser. Whilst this means a lesser web experience for you, what it also means is increased headaches for web developers. While we can’t reasonably expect clients to automatically adopt the newest technology on the block - this can often be hardest for larger companies who tend to organise their upgrades according to budgetary requirements and so on - at the same time it’s cumbersome to have to try to support outdated versions of software (and hardware) that has no reason to still be in use. The big boys have already started taking this approach. Unfortunately the browser functions fundamentally different to every other major browser available (including both later versions of Internet Explorer; IE7 and IE8), does not conform to agreed web standards and is severely limited in its capabilities. Please don’t think that dropping support for IE6 - a browser that was launched in 2001 - will immediately alienate your customers. You could always suggest to your development company to take the proactive approach by warning your users that their browser is outof date. The most important thing to remember as well is that, in most cases, you will find that the majority of your website will still function anyway; it just won’t look as nice as it should. Next time your web development company tells you that they don’t want your new website to be limited by an older technology, it is worth listening to them. The more people that upgrade to a newer browser, the better your own website can be. Without the need of such legacy support, more time and effort can be focused on making your website just that little bit better. If you run IE6 at home, please consider switching to IE7, IE8, Firefox, Chrome or Safari. If your office is restricted to using Internet Explorer 6 it is time to start hounding your IT department! View Next blog Disruptive Online Marketing - To Use Or Not To Use?